Art inspires. A painting or a beautifully expressed idea or sculpture can cause even the most casual observer to pause and think. For artists and writers, that same work can fuel additional artistic expression. A poem can inspire a painting. A painting can inspire a poem. The Visions of Verses Exhibition at the calvART Gallery in Prince Frederick celebrates this idea. The show, which features poetry inspired by local artists’ work, will run from April 11 to May 5, with a free reading and reception set for 5 to 8 p.m. on April 13. 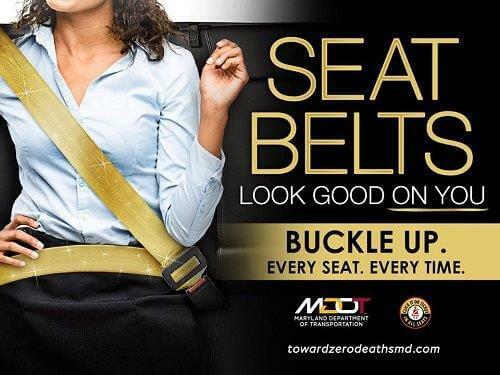 The show is made possible through support by The Arts Council of Calvert County, Maryland State Arts Council, College of Southern Maryland (CSM), the CSM Foundation and calvART Gallery. Last year’s event featured art that was inspired by poetry. 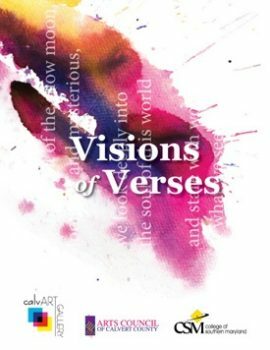 This year’s Visions of Verses Exhibition features poetry that was inspired by visual art — acrylics, oil and watercolor paintings as well as ceramic on wood, felting, mixed media, stained glass sculpture pieces. Poet Michael Glaser is participating in this year’s exhibition. Glaser, who served as Poet Laureate of Maryland from 2004 to 2009 and is a Professor Emeritus at St. Mary’s College of Maryland, chose to write a poem inspired by photographer Lonnie Harkins’ “Pier to the Sky,” a digitally edited photo of a pier that appears to lead into the clouds in the sky. The image “struck me as offering a solid, physical image of how so much of life feels like stepping off a pier into the unknown,” Glaser said. CSM Languages and Literature Professor Neal Dwyer describes Visions of Verses as an example of “a wonderful collaboration between CSM and our regional arts councils.” He notes that the participating poets include current and former CSM professors, as well as former CSM students. Dwyer composed two poems for the event — “upturned against the dark,” inspired by Carol Wade’s acrylic painting “Angel Trumpets,” and “before the divorce,” which was inspired by a photo by Barbara Boward. 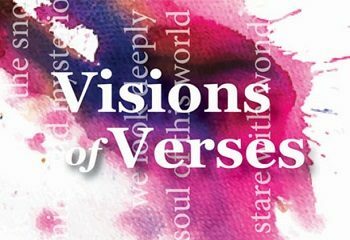 In addition to Glaser and Dwyer, regional poets participating in this year’s Visions of Verses include Jesse Alexander, Karen Anderson, Crystal Brandt, Anne Caston, Jeffrey Coleman, Carol Harvat, Sherbie Kardinal, Hiram Larew, Elsivetta Ritchie, Rachel Anastasia Smith, Daniel Yu, Katherine Lassman and Joanne Van Wie. CalvART Gallery member artists participating, in addition to Harkins, Wade and Boward, include Randy Estabrook, Wendy Schneider, Mimi Little, Mary Blumberg, Alison Barry, JoAnn Gilhooly, Keith Gordon, Ann Crain, Nancy Bateman, Pat Morrison, Steve Richardson, Suzanne Shelden, Nancy Bateman, Ann Trentman, Phyllis Noble and Marie Estabrook. The calvART Gallery is located at 110 Solomons Island Road S. and is open Wednesday through Sunday from 11 a.m. to 5 p.m. For more, visit www.calvartgallery.com. For information on arts events in Calvert County, visit www.calvertarts.org. For information about language and literature studies at CSM, visit www.csmd.edu/programs-courses/credit/academic-divisions/ecl/.